On Wednesday June 4, students, scholars, and visitors gathered around a table in Queen’s College to examine the parchment binding of an early book from the college’s collection. Dr. Henrike Lähnemann remarked on the reuse of the parchment, and invited her audience to feel the parchment — to recognize its texture and thickness. As Dr. Lähnemann’s research has shown, these qualities make parchment not only a suitable book binding, but an ideal dress lining. Dr. Lähnemann, chair of German Studies at Newcastle University, presented the fifth lecture in a series organized by the Workshop for Manuscript and Text Culture. 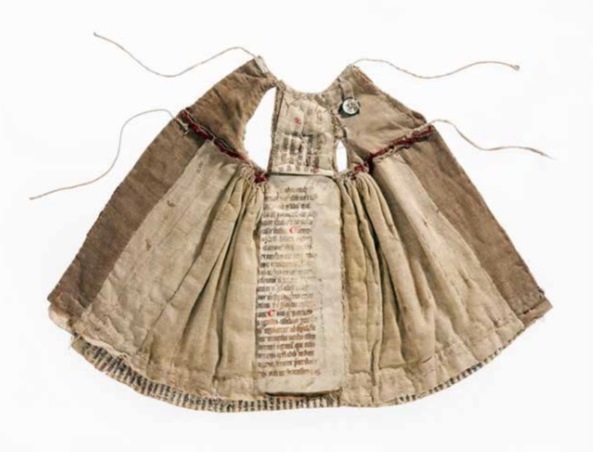 Her talk, titled ‘’Text and Textiles: Manuscript Fragments in Medieval Dresses,’’ introduced the audience to research that began in 2011, after textile conservators discovered fragments of medieval manuscripts lining the hems of dresses at the Cistercian convent of Wienhausen in Northern Germany. The dresses in question, made by nuns in the late fifteenth century, clothed the convent’s statues. In her presentation, Dr. Lähnemann used four case studies to address the ‘’where, when, and how’’ of the topic at hand. The medieval dresses were made of patches of different cloth such as linen, velvet and silk, some in the form of lampas, a luxurious material, and sported rabbit fur trim. To achieve drapery-like folds in the fur, the nuns stiffened the hems by lining them with strips of parchment gathered in folds by means of a thread. The parchment, said Dr. Lähnemann, was not brought into the Convent for the purpose of lining. 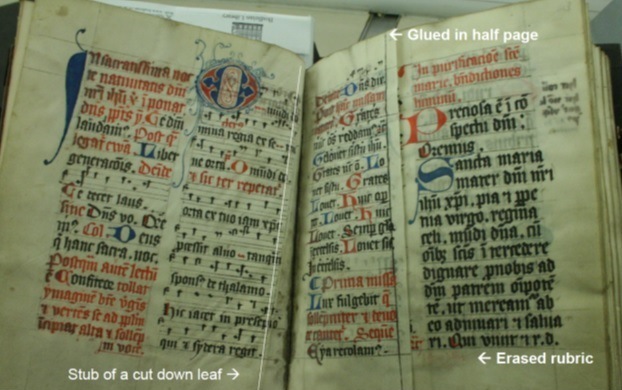 In fact, the manuscript fragments that have been discovered are recycled materials that include liturgical manuscripts and legal texts. Book recycling was common in the late fifteenth century, as evidenced by a manuscript from the Bodleian’s own collection (below). Because this was a period of religious reform, liturgical texts became outdated particularly quickly, accounting for their use as dress lining. Next Next post: ‘A delicate attention’ from the suffragettes?